We know that if we look hard enough online, we can usually find what we’re looking for. Can you guess how many raised their hands? If you guessed “1,” you’re right. Only 1 person in 100 had actually discussed pricing on his/her company website. But here is the other shocking statistic—when I asked these same business owners what percentage of their customers ask about pricing and cost within the first few minutes of an initial contact/conversation, every person in the room raised his/her hand. Surprising? Of course not. People like to know how much stuff costs. That’s just the way we’re all wired. Notwithstanding, the majority of businesses around the world have elected to skirt the subject of pricing on their websites for a variety of reasons, the most common being fear of losing a prospect before he or she ever contacts the company. And although this “hidden approach” may have worked in marketing 5 or 10 years ago, I’m here to say that today’s consumers don’t like their core questions to be left unanswered. Furthermore, if we are truly to embrace content marketing and the essence of social media, we must learn to embrace every question consumers ask our company. In other words, if your customer is thinking it, you should be addressing it. This transparent, common-sense approach is the essence of successful modern-day marketing. Beyond this, though, I want to delve further into the subject of pricing. So before you say, “Marcus, you’re crazy and I’ll never discuss pricing on my website,” I’d ask you to consider the following five points. Most of us have heard of SEO, or search engine optimization. In a nutshell, SEO is the process by which the search engines like Google display web pages that address the word(s) a searcher is looking for. For those of you who know me, you know I’m a “pool guy.” Before I started teaching businesses about the power of content and inbound marketing, I sold in-ground fiberglass swimming pools, and in fact I still own the company—River Pools and Spas. 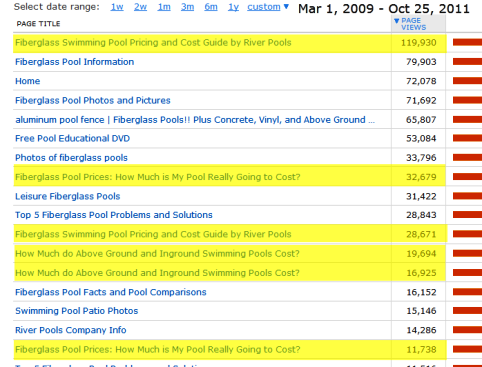 In 2009, when we decided to embrace the power of content marketing and started blogging in such a way to answer every consumer question we’d ever received, one of the first articles we wrote was about fiberglass pool pricing. 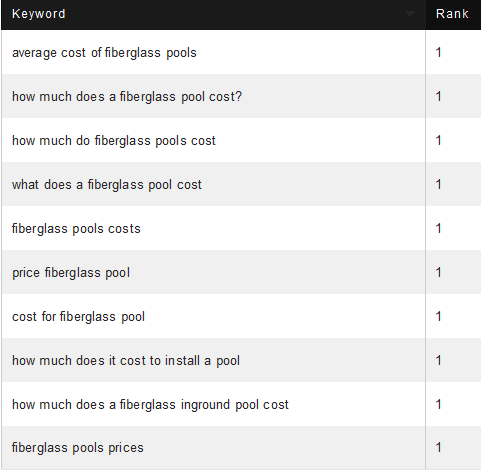 Here is a small snippet of the main cost page of our website, which gives visitors a great feel for what goes into fiberglass pool pricing. What’s interesting, though, is the fact that up until that point, no one in our industry had covered this subject on their website in any detail. Instead of addressing the number-one consumer question up front, they decided to wait until the initial phone contact, or worse, the first sales appointment in the home. With such a dearth of content with regards to this one very important question, you can imagine just how easy it was to rank on Google for such a phrase. In fact, within 24 hours of writing that one article, we managed to rank #1 on Google for such phrases as listed below. This one page literally ranks #1 on Google for over 100 cost-related phrases. If you type a few in Google, you'll see exactly what I'm talking about here. When we saw the dramatic impact this one article had on our website’s traffic and total leads, we then went even further and wrote more cost/price-related articles that refer to our industry. As you can see, of the top 15 pages of the company website, 5 are price-related, which indicates just how much visitors care about this subject. But just saying “we got traffic” from writing these articles isn’t enough, as the ultimate goal of any content on our website is to directly or indirectly produce profits. 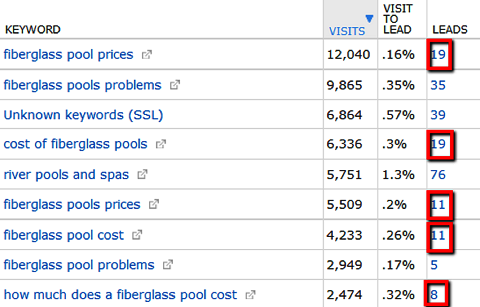 This being said, because we track web analytics and leads so closely, as well as the keywords these shoppers utilized to find our site, we’ve been able to attribute over $1,000,000.00 in swimming pool sales from this one article. Here is a screenshot showing the number of leads that came from these price-related keywords, many of which ended up turning into a sale—one we would not have had if we weren't willing to discuss the subject. Because we weren’t afraid to answer this one question on our website, we reaped the reward. This is the essence of how Google works. This is also the essence of content marketing done right. Have you ever gone through the process of meeting a prospect, giving a sales presentation and dedicating hours of time and effort only to get to the point of “pricing” and watch the whole thing fall apart in the blink of an eye? I had this happen to me for years in the swimming pool industry. Because I was afraid to address the subject of price on my company website, I’d meet with homeowners for hours (taking time away from my own family) only to get to the end and have the person tell me I was completely out of their budget. But I submit this question: Whose fault was it that this prospect was shocked with my pricing? Despite what some folks say, no business is a great fit for every potential client in the world. Whether you sell a product or service, not everyone is for you. I didn’t truly understand this principle until I became open to the discussion of pricing on my website and then with initial conversations with potential clients. But once I clearly accepted the reality that some folks were not a “good fit” for my company, I stopped fearing the subject of pricing and started to embrace discussion regarding this all-important issue, especially early on in the conversation. And do you know what the results were? I think we can all agree this is the ultimate goal of a business owner. Here is the really funny part to all of this—many of the same companies that don’t address pricing on their website end up having to answer the question as soon as the prospect calls their store/business. And if they still don’t give the prospect at least some idea of pricing on the phone, many will just end up getting upset and moving on. But here is the thing about answering this question of pricing—you really don’t have to answer it at all. For example, with my swimming pool company, our projects typically cost $25k-100k, which is a pretty big range. There are literally hundreds of factors that can dictate the ultimate price. Because of this, our pricing page gives ranges, not definitive numbers, this will allow potential clients to get a feel for the cost and know if they’re at least in the ballpark. It also thoroughly teaches them the ins and outs of what goes into pricing a fiberglass swimming pool. To understand what I’m referring to about addressing vs. answering, watch the following 2-minute video. It shows a little “debate” I had with someone at a recent conference when discussing this very subject and the result is something you won’t want to miss. #4: If You’re Embarrassed to Talk About Your Pricing, How Do You Think Customers Feel? There are two types of companies—ones that recognize the value they give to customers and are proud of their pricing, and ones that are afraid their products don’t carry enough value to get what they’re asking for. Whether or not we want to admit it, the manner in which we discuss the pricing of our products and services goes a long way in the perceived value of said products and services. So be proud of what you sell. Give pricing to customers with a smile. This projection of confidence will definitely have a direct impact on sales. If I had a dollar for every time someone told me, “Marcus, thank you for being willing to discuss pricing on your website. I’ve been looking all over the web and no one is willing to answer my questions!”, I’d be a wealthy man. Think about it for a second—if a potential customer sees two equal websites, but one very openly discusses and teaches about pricing while the other does not, who is most likely to get the phone call? When it comes to marketing in this day and age, we all have an opportunity to stand out. But we’ve got to be more transparent. If we are, not only will the search engines love us (because we’re addressing subjects that so many people are searching for), but also consumers will see that we’re different than the rest of our competitors. I have taught this principle of pricing to many, many businesses. Most never give it a try. But the ones that do inevitably come back to me and are shocked with the positive results. When we really boil this all down to its essence, we’re not so much talking about pricing here, but rather about trust. And when it comes to marketing, trust equals more leads, and eventually, more leads will equate to more sales—a fact that can make all the difference in the world when trying to survive in today’s difficult market. Considering this is such a polarizing topic for many businesses, I’m curious to know your thoughts. What do you think? Should we include some pricing information on our websites? If you don’t do it, why not? And for those of you who do, what have been the results? Jump in, folks. I’m very curious to hear what you have to say about this important subject. Leave your questions and comments in the box below.